Chelsea’s interest in Uruguayan midfielder Matias Vecino may soon bear fruit following new developments at his current club Inter Milan. Vecino has enjoyed a busy summer with Uruguay as they reached the quarter-finals of the World Cup in Russia, ultimately losing out to eventual champions France 2-0. The 26-year-old midfielder currently plies his trade with Inter Milan in Serie A and made 29 appearances for the club last year as they finished 4th in Italy to qualify for the Champions League. Inter have already signed highly-rated Belgium International Radja Nainggolan from Roma this summer, which has increased competition for places at the club and now additionally look set to sign Arturo Vidal from Bayern Munich, according to the Evening Standard. If they do indeed manage to bring the tenacious midfielder to the club then Vecino’s position in the team will be even more uncertain, which will be music to the ears of Chelsea boss Maurizio Sarri. The Blues opened talks with the Uruguayan over the weekend, according to the Evening Standard, and Sarri previously worked with Vecino during in his spell as manager of Empoli a few years ago. 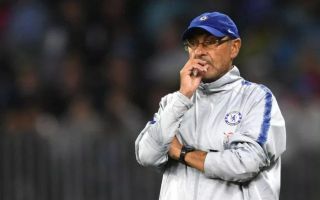 The new Chelsea boss will be keen to put his stamp on his new squad during the current transfer window and has already signed Jorginho from his former club Napoli to increase the team’s options in the middle of the park. Vecino is an accomplished holding midfielder who excels at breaking up play and feeding attacking players, meaning he would undoubtedly add considerable quality and top-level experience to Sarri’s current squad. This kind of strengthening is surely needed after Chelsea slumped to fifth place in the Premier League last season, with flop signings like Tiemoue Bakayoko and Danny Drinkwater far from good enough replacements for the departing Nemanja Matic.